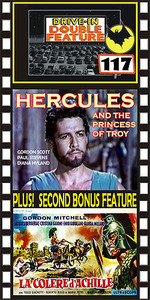 HERCULES AND THE PRINCESS OF TROY (1965) Gordon Scott, Paul Stevens. One of the best spectacle films we offer—really. Scott is very good as Hercules in this wonderful color fantasy. A giant sea dragon must be fed a beautiful female virgin from time to time, otherwise it will wreak havoc upon an ancient Greek city. When the local warriors are unable to kill the beast, Hercules steps up to the plate. Originally intended as a TV pilot, but syndicated as a short feature instead. Color, 16mm FURY OF ACHILLES (1962) Gordon Mitchell, Jacques Bergerac, Gloria Milland. The epic story of Troy. Achilles, who initially resists the idea of leading an attack on the fortified city, eventually leads the Greeks to victory over the embattled Trojans. This is a fine retelling of the legendary story with many great action scenes. Mitchell is especially good in what may well be his best film. Recommended. Color, from 16mm.